My sister sometimes sends me pictures of her cats – which I thoroughly look forward to! They have crazy personalities, but are pretty shy when it comes to meeting new people. A while back I was cat-sitting for my sister and her husband. I was a little bit nervous because, even though I had been around their cats a few times, they never really warmed up to me. Well, when it came time that my sister and her husband left, the cats had no one to turn to but me. Desperate situations call for desperate measures! By the end of my stay with them, they were regularly snuggling up against me and sitting in my lap; I felt honored. Of course, like all cats, as soon as my sister and her husband returned, the cats acted as if I had never been there and that we had never shared these precious moments! 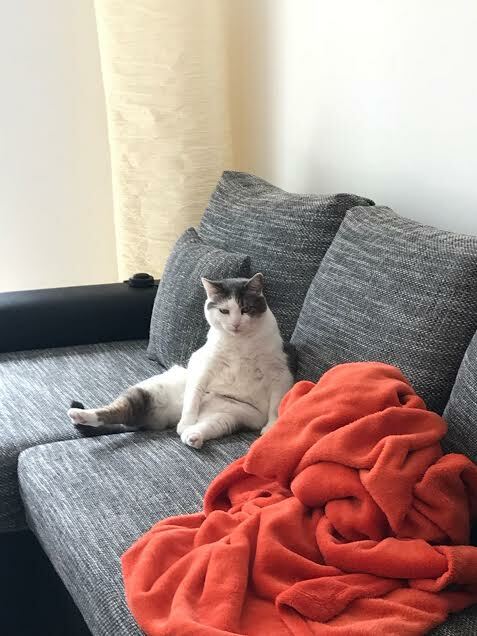 Picture below is one of my sister’s cats reclining on the couch.